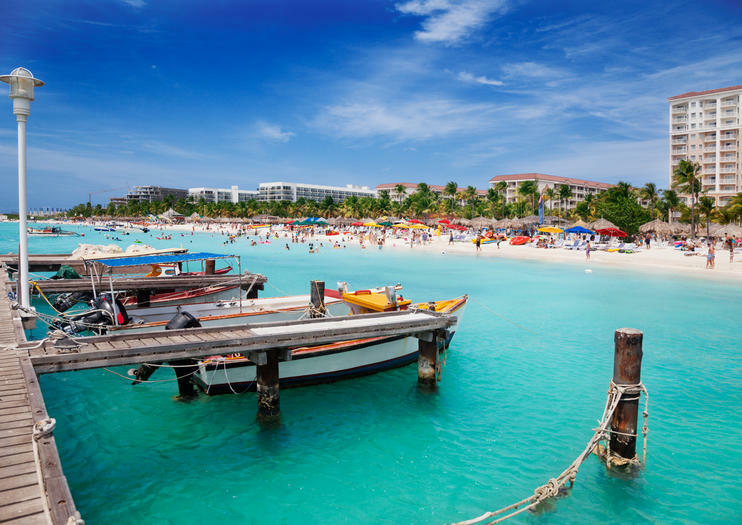 Part of the Leeward Antilles' ABC islands in the southern Caribbean, Aruba draws in travelers with its miles of beaches, nearly year-round sunshine and colorful capital city. Take a shore excursion to see highlights like the Natural Bridge, Arikok National Park, an abandoned gold mine and the California Lighthouse, or spend your day taking advantage of the sun and surf – water activities range from snorkeling and kayaking to parasailing and banana boat rides. You’ll dock in downtown Oranjestad, the capital of Aruba. You can walk to shops and restaurants, but you’ll need to drive to any beaches – take a taxi from the dock, or rent a car. Of course you want to hit the beach, but spend your first hour or two in Oranjestad, admiring the Dutch architecture and getting your fill of duty-free shopping. Check out Seaport Village Mall first, as it’s just across the street from the cruise terminal, and then mosey up to Caya G. F. Betico Croes, the main shopping strip. If you’re interested in history, visit Fort Zoutman, which dates back to the 1700s and houses the Aruba Historical Museum. Then grab a cab and head for the sand – your options are many, so narrow it down based on what you want for the day. Palm Beach is a typical postcard beach with white sand, high-rise resorts with casinos, plenty of beach activities and crowds to go with it all; Eagle Beach is an easy pleaser with the longest stretch of sand on the island, boutique-ier hotels and portions of shade; Baby Beach lives up to its name with calmer, shallow water, making it the best bet for small kids; and Arashi Beach offers a quieter atmosphere, popular with locals.